This edited book draws from work that focuses on the act of telling family stories, as well as their content and structure. The process of telling family stories is linked to central aspects of development, including language acquisition, affect regulation, and family interaction patterns. This book extends across traditional developmental psychology, personality theory, and family studies. Drawing broadly on the epigenetic framework for individual development articulated by Erik Erikson, as well as on conceptions of the family life cycle, the editors bring together contemporary examples of psychological research on family stories and their implications for development and change at different points in the life course. The book is divided into sections that focus on family stories at different points in the life cycle, from early childhood and the beginnings of narrative skill, through adolescence, young adulthood, midlife, and then mature adulthood and its intergenerational meaning. During each of these periods of the life cycle, research focusing on individual development within an Eriksonian framework of ego strengths and virtues is highlighted. The dynamic role of family stories is also featured here, with work exploring the links between family process, intergenerational attachment, and storytelling. Sociocultural theories that emphasize how such development is situated in the wider cultural context are also featured in several chapters. This broad lifespan developmental focus serves to integrate the exciting diversity of this work and foster further questions and research in the emerging field of family narrative. The book is intended primarily for researchers and advanced-level students in the fields of developmental and personality psychology, as well as those in family studies and in gerontology. It may also be of interest to those in the helping professions who are concerned with family therapy and family issues, and may--due to its content and illustrative material--have appeal to a wider market of the lay public. The chapters are written in a readily accessible style and the analyses are presented in a fairly non-technical way. 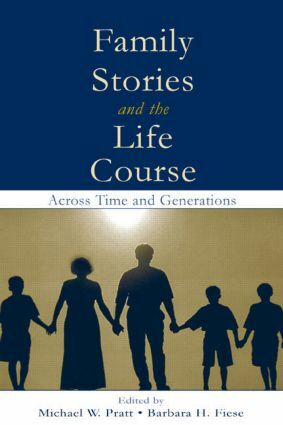 Because family stories are charted across the lifespan, it would be a suitable companion book to a more traditional lifespan textbook in certain courses. Contents: Preface. M.W. Pratt, B.H. Fiese, Families, Stories, and the Life Course: An Ecological Context. Part I: Child Narratives: Competence and Attachment Development. C. Peterson, A. McCabe, Echoing Our Parents: Parental Influences on Children's Narration. R. Fivush, J. Bohanek, R. Robertson, M. Duke, Family Narratives and the Development of Children's Emotional Well-Being. E. Sher-Censor, D. Oppenheim, Coherence and Representations in Preschoolers' Narratives: Associations With Attachment in Infancy. J. Robinson, M. Eltz, Children's Empathic Representations in Relation to Early Caregiving Patterns Among Low-Income African American Mothers. Part II: Adolescent Narratives: Identity Development and Its Contexts. N. Dunbar, H.D. Grotevant, Adoption Narratives: The Construction of Adoptive Identity During Adolescence. M.L. Arnold, M.W. Pratt, C. Hicks, Adolescents' Representations of Parents' Voices in Family Stories: Value Lessons, Personal Adjustment, and Identity Development. A. Thorne, K.C. McLean, A. Dasbach, When Parents' Stories Go to Pot: Telling Personal Transgressions to Teenage Kids. Part III: Young Adulthood: Intimacy and Relationship Narratives. S. Dickstein, Marital Attachment and Family Functioning: Use of Narrative Methodology. Part IV: Midlife: Parenting and Narrative Socialization Processes in the Family. D.P. McAdams, Generativity and the Narrative Ecology of Family Life. B.H. Fiese, N. Bickham, Pin-Curling Grandpa's Hair in the Comfy Chair: Parents' Stories of Growing Up and Potential Links to Socialization in the Preschool Years. Q. Wang, The Cultural Context of Parent-Child Reminiscing: A Functional Analysis. H. Fung, P.J. Miller, L-C. Lin, Listening Is Active: Lessons From the Narrative Practices of Taiwanese Families. Part V: Aging and Grandparenthood in Narrative. O. Gould, Telling Stories and Getting Acquainted: How Age Matters. J.E. Norris, S. Kuiack, M.W. Pratt, "As Long as They Go Back Down the Driveway at the End of the Day": Stories of the Satisfactions and Challenges of Grandparenthood. E.B. Ryan, K. Pearce, A. Anas, J.E. Norris, Writing a Connection: Intergenerational Communication Through Stories. Part VI: Conclusions and Future Directions. B.H. Fiese, M.W. Pratt, Metaphors and Meanings of Family Stories: Integrating Life Course and Systems Perspectives on Narrative.